Off the longest county coastline in Ireland, around scores of islands, as many lakes and along 100 rivers, the inhabitants of Mayo have taken to their boats and exploited our county's waterways in a sustainable manner for hundreds of years. That strong heritage is etched on our crest and is alive and celebrated today. Irish traditional boats in general took on distinctive regional characteristics and the designs of crafts were shaped by purpose, available materials and historical circumstances. Because of our geographical size, Mayo has been a focus of academics studying our many contributions to traditional boat typology. Mayo's clean freshwater rivers are famous for their fishing, chief among them the River Moy. Mayo's longest river gave birth to at least two distinctive boat types. The Moy Cot is a long flat bottomed boat and is a descendant of the early dug-out log boats. This five-metre long boat was used for angling on the River Moy. Another boat known as a Moy Cobble, measuring 4.5 metres in length, was used for draft-netting on the same river. An account of a rush raft used on the Urlaur lakes in east Mayo in the middle of the last century describes a simple wooden frame, the base of which was packed with bull-rushes tied together with bogdeal. The variations in our boats increase once you encounter the county's maritime tradition. Possibly the most recognisable of the traditional boats is the currach. At the beginning of the 19th century currachs were typically small wicker frames covered by animal skin and could carry two men. By the 1830s, improvements in currach design had reached north Mayo and Belderrig in particular. The new designs of wood planking for the frames and tarred canvass covers allowed for larger boats, which meant more crew, cargo or catch could be taken on. At 23 feet long, the Belderrig currach could carry five men. A 1927 report classified the land of the Inishkea Islands as being of a light, sandy nature and totally unsuitable for cultivation. Long before that report, and in order to eke out a living, the islanders were driven to the sea where they developed a distinctive, local two-man currach that could negotiate the islands' rocky shores. On Achill Island and along the west coast of Mayo from between the late nineteenth and the first four decades of the 20th century, the Achill yawl was the most common boat. With its small sail, it was particularly suited to navigating the channel between the mainland and Achill Sound. As with other boats, the yawl was used for a number of functions. Heavier yawls were constructed to carry turf and livestock while lighter versions were constructed for fishing. The ferrying of people to and from Achill Island was an important role at a time when the road network in the area was underdeveloped. The harvesting of seaweed was a valuable source of income for the coastal communities. The quality of seaweed as a fertiliser was well understood and harvesters would stay out all night taking what came in with the tide. It was then hauled long distances by boat to be spread for the improvement of farmland. Seaweed was considered a complete manure, that is, it contains the three principal constituents from which manure derives, nitrogen, phosphates and potash. Owing to the large quantity of potash it contained meant it was specifically suited for growing potatoes. The lighter yawl was also used for racing. 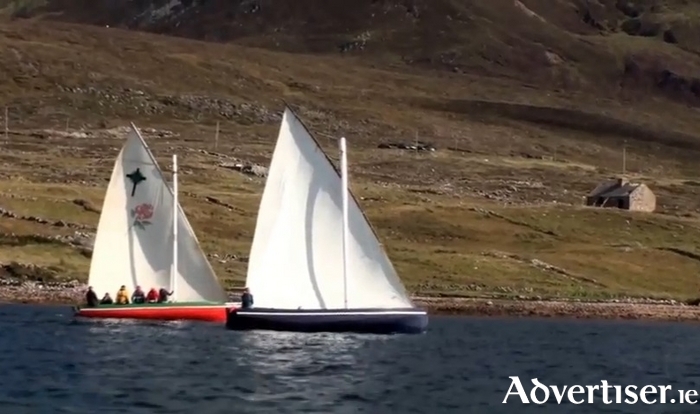 The Achill regatta was the island's main annual event held during the summer months. As a taste of the racing on offer, the race list of the 1896 regatta at Achill Sound began with a sailing race for yawls of 16 feet, which was the length of the Achill Yawl. The second race was a rowing race for yawls and on the race schedule went. Boatmen were competing for pride and a first prize of £2. The shore was teeming with spectators from across Mayo. One thousand people travelled from Castlebar by train to attend the 1896 regatta and see the unparalleled seamanship of the islanders. The excitement and skill of those sea races is still to be found in Mayo. Several sea-themed festivals, which include currach and yawl racing as part of their entertainment, are taking place along our coast and on our islands this summer. The racing continues this weekend at Féile na mBiollaí (Bill's Rock Festival ) at Dooega on Achill Island. Rare examples of some of the Mayo boat types referred to in this article are stored at the National Museum of Ireland - Country Life outside of Castlebar but all are not currently on public display. Oh the Green and Red of Iceland!